With a refugee population firmly established, and in a nod of confidence, Missoula Federal Credit Union put its money behind its values on Wednesday night, donating $20,000 to Soft Landing Missoula and the International Rescue Committee. Joined by members of the Global Alliance for Banking on Values, credit union president and CEO Jack Lawson praised Missoula’s resettlement efforts, saying financial institutions hold great sway over today’s social and economic outcomes and must place good over profit. The International Rescue Committee reopened Missoula’s resettlement office in 2016. Since then, the city has welcomed around 240 refugees from four different countries, including Iraq and Syria, the Democratic Republic of Congo, and Eritrea. Since the program began, Missoula Federal has emerged as a partner in the city’s resettlement efforts, offering financial literacy to help new arrivals navigate the U.S. banking system and build credit, given that many come with no credit history. That effort helped one refugee family purchase a car to get to work and shuttle children to school. Other programs, such as tax assistance from the University of Montana’s College of Business, and computer training through the Lifelong Learning Center, have also helped new arrivals build a financial future. 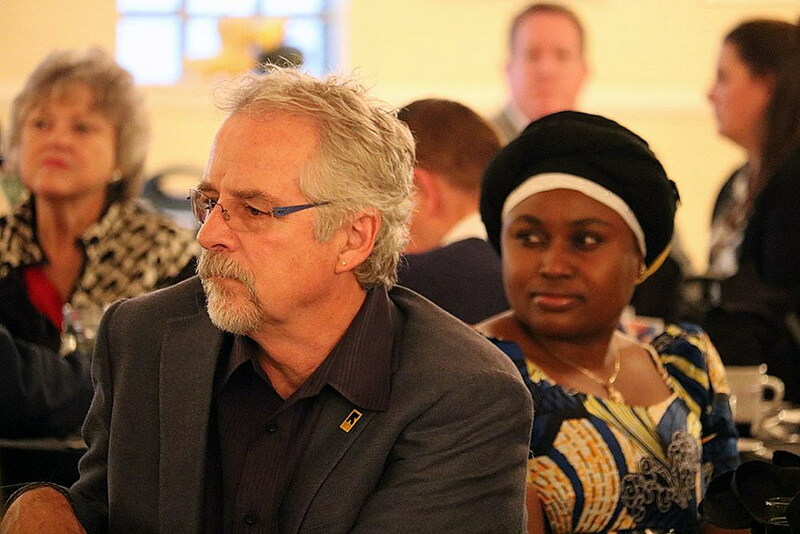 That community effort hasn’t gone unnoticed by those who work daily with the refugee population, including Patrick Poulin, acting director of the International Rescue Committee’s Pacific West region. As Poulin mingled with the evening crowd, including Missoula County commissioners, Mayor John Engen, members of the City Council and community advocates, he stepped aside to discuss the role Missoula has played in the larger effort to resettle the planet’s 24 million refugees. While the numbers may be small in Missoula when compared to the greater need, Poulin said, the city has emerged as a model of success. The Pacific West region includes 13 offices spread across Washington, California, Arizona, Idaho and Utah. Montana’s only office is located in Missoula, which received 115 refugees in Fiscal Year 2018. Poulin anticipates another 120 refugees to arrive in Missoula this fiscal year, which began in October. That’s despite the Trump administration’s efforts to slow the number of refugees who are accepted annually into the U.S. The diversity present at Wednesday night’s event could foretell the city’s future and, for many, it’s a welcome one. For those who are new to the community, the chance for a fresh start is equally welcome, though it’s not taken for granted. Gloria Musehenu and his wife, Lisa Kabamb, arrived in Missoula from the Congo. People here are friendly, they said, and the city is a “wonderful” place to be. But there are challenges, too, from the Montana weather to the family’s lack of transportation and laying financial roots. Already, Lawson said, the credit union strives for transparency, from its strategic plan to its philosophy on compensation. So too does it look to effect positive social and economic outcomes across the community.